Was Something In The Water? Cleveland Seeks Answers After Air Passengers Fall Ill Six passengers were stricken on the Tampa-bound flight, prompting Cleveland airport officials to shut down and clean water fountains. 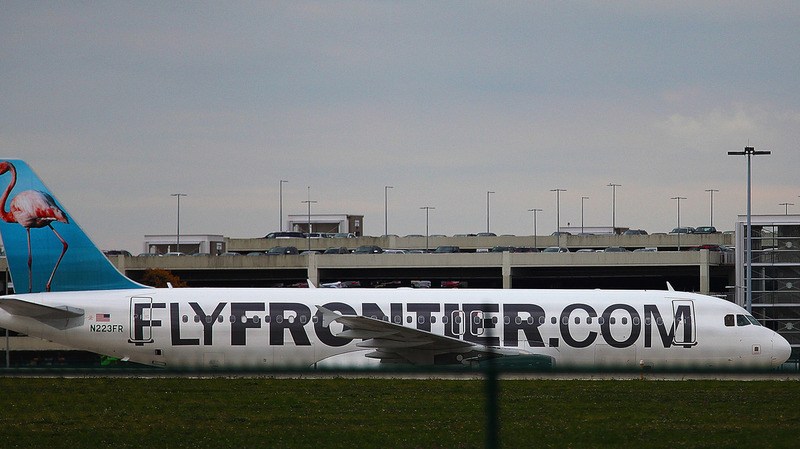 A Frontier Airlines plane at Cleveland Hopkins International Airport in 2014. On Tuesday, passengers were delayed in Tampa after six passengers on a Frontier flight out of Cleveland became sick. Cleveland Hopkins International Airport temporarily shut down water fountains in its Concourse A and is sanitizing them after several passengers became ill aboard a Tampa-bound Frontier Airlines flight on Tuesday. At least six passengers were stricken and "the primary symptom was vomiting," Janet Scherberger, spokeswoman for Tampa International Airport, told NPR in an email. "It appears the six individuals did not have any connection to each other." While the cause of the illness remains unknown, the city of Cleveland said that "an early report from Frontier indicated each of the passengers may have used a public drinking fountain before the flight." The city's Department of Public Health is in the process of contacting the six passengers to find out whether they did indeed drink from a fountain. In the meantime, officials are sending water samples from airport fountains to a lab for evaluation. The city also emphasized in its statement that the cause may very well turn out to be unrelated to drinking water. It said that "water borne illnesses generally have a longer incubation period than what we saw in this instance." To that end, officials are looking at other potential causes for the sickness, "including passenger activities before arriving at the airport." There were some 226 passengers aboard the New Year's Day flight, according to Scherberger. The Centers for Disease Control and Prevention told NPR that it provided technical guidance to local EMS and health officials who boarded the plane in Tampa to evaluate the sick passengers. They "determined there was no risk to other passengers or crew, and allowed the sick passengers to continue with their travels," CDC spokesman Bert Kelly said. Nobody was hospitalized, according to Scherberger. The city of Cleveland noted, "On New Year's Day, more than 11,000 passengers traveled through (Cleveland Airport) and no other passengers have reported illnesses." It added, "Cleveland Water has no known water safety issues in the vicinity of (the airport), but is collecting additional street-level samples to verify."